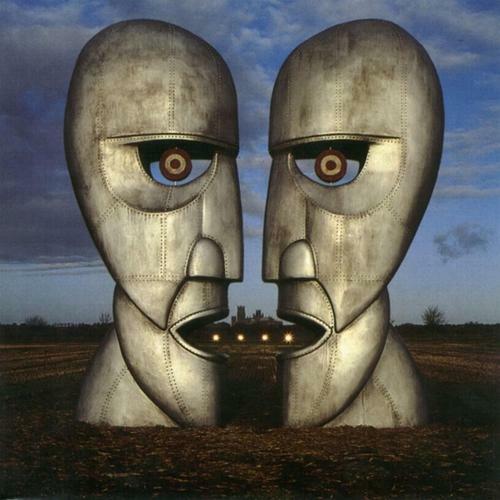 Division Bell was a significant improvement over Gilmour's A Momentary Lapse of Reason, showing the group return more to its traditional form. Instead of the beginning of a David Gilmour solo album turning into a Pink Floyd album, Division Bell started off as a group effort, this time with Richard Wright as a full member again. It's true that Gilmour is the most dominant force behind the album (lyrics, vocals, guitar solos everywhere), but he doesn't overwhelm the album and Wright's presence clearly can be heard. Lyrically this album is more of a return to the Wish You Were Here and Dark Side of the Moon days as they are quite poetic and intelligently scribed. Again, like A Momentary Lapse of Reason, no specific concept is presented on the album, although most of the music deals with the theme of communication and lack of it. Some of Gilmour's lines sound like they're directly inspired from his fallout with Roger Waters. Musically the album is more spacier than previous efforts and takes a mostly song-oriented approach. Long gone are the days of 10-20 minute epics for these guys. Over the last few years my opinions of this album have moved about from being a masterpiece to just being good, but with more recent listens it seems to have aged quite well. It, like most Pink Floyd albums, is another gem in their long history as a hallmark of progressive rock. An excellent and worthwhile purchase and their most significant contribution after 1980. Easily four stars.